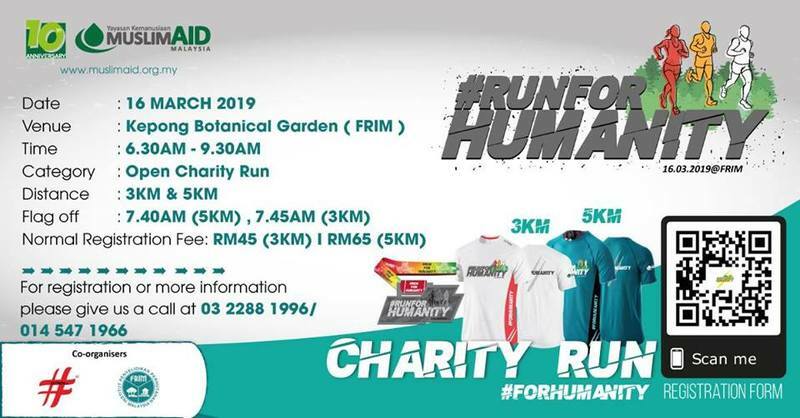 Hi, we need a volunteers for our #Run4Humanity programme whish is charity run event. it will be a valuable and fun experience to you all !! Muslim Aid Malaysia Humanitarian Foundation (Muslim Aid) is an aid and development organisation under the ambit of Muslim Aid Asia (MAA), which in turn is part of the Muslim Aid International (MAI) network of non-governmental organisations working towards the two-pronged goal of eradication of poverty and educating underprivileged children worldwide. The Foundation officially came into being in 2008 as an extension of MAA, established four years earlier as the Asian chapter of its UK-based parent organisation.Non-political and non-sectarian, Muslim Aid is inspired by Islamic values and works within the parameters of Islam irrespective of religion, colour and creed. The establishment of the Asian chapter in 2004 aimed to provide platform and focus for Malaysians to join hands with the world community at large in tackling the persistent and recurring problems of local and global poverty and suffering as a result of both natural and human disasters (flood, earthquake, endemic poverty, civil strife, war etc). The Foundation™s establishment in 2008 further serves these goals. A year later the Foundation was granted tax exemption status by the Inland Revenue Board of Malaysia (LHDN), thereby providing donors tax deductibility for their generous donations.